Experience the convenient luxury of recharging your SimplyGo battery without plugging your concentrator in to the AC or DC power supply with the Respironics SimplyGo External Battery Charger. With the added convenience of being able to recharge your battery without plugging your concentrator in you are able to get more accomplished throughout your day. The single-bay external battery charger is equipped with an 110v power cord allowing you to recharge your battery wherever you’re staying. 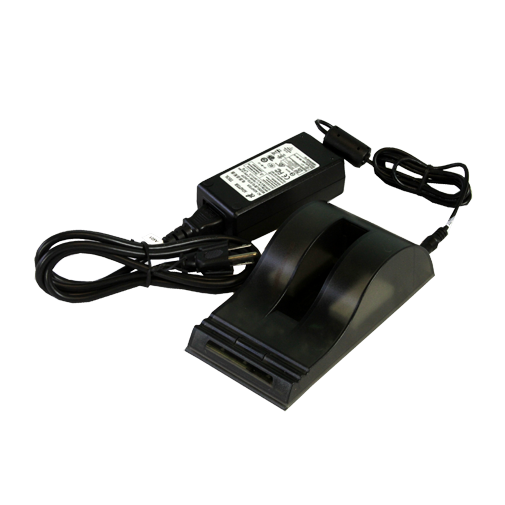 Along with recharging your battery, this external battery charger has the capability of recalibrating your battery. To notify you when the charging or recalibrating cycle is done, it is equipped with an LED indication system. Without the Respironics SimplyGo external battery charger your only option to recharge your battery is to plug it into the AC or DC power supply. This means plugging your concentrator in and limiting your productivity until your battery is fully charged. With the SimplyGo external battery charger you have the ability to recharge your battery regardless of what you need to get done. With a quick recharge time of 2 – 3 hours, you can run some errands and come back to a fully charged battery to keep your day going. As you use your SimplyGo more and more, you may notice your battery doesn’t hold a charge as long as it used to. In most cases this would indicate you need a new battery, however, the SimplyGo external battery charger has a calibration mode. Calibrating your battery will reset the lithium-ion cells to ensure it holds as much of a charge as possible. If your battery is extremely old, calibrating your battery may not have a significant impact. The calibration process can take up to 8 hours per battery. The LED indication system will notify you once the calibration process is complete. If it takes longer than 8 hours, your battery needs to be replaced. The LED indication system shows you what stage your battery is at during the charging or calibrating process. It is a multi-colored LED indication system to make it easy for you to identify what mode you are using. When set to charging mode the LED indication system uses green lights. When using the calibration mode the LED indication system uses blue lights.